Discover the art of rug hooking and techniques. Get both the book and the swatchettes together in one kit. 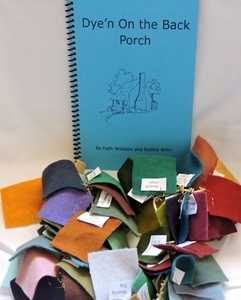 Swatchettes are approximately 1.5" x 1.5" square wool squares dyed using the recipes in the book. A great way to see what colour the dye recipe is intended to be. 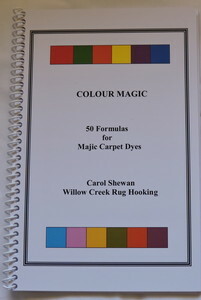 The Colour Magic dye book is a great starter book for the new dyer with instructions on basic open pan dyeing. It will be a nice addition to the experienced dyers library. 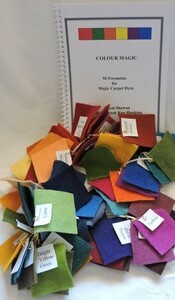 There is a variety of formulas for bright vibrant colours as well as softer more muted hues. 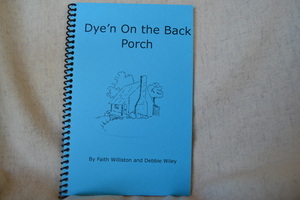 Dye'n on the Back Porch by Faith Williston and Debbie Wiley plus the complete swatch library made from the recipes found in the book. They're here! Swatchettes made from the recipes found in the book Dye'n on the Back Porch by Faith Williston and Debbie Wiley. Swatchettes are 1.5x1.5 inches approx. 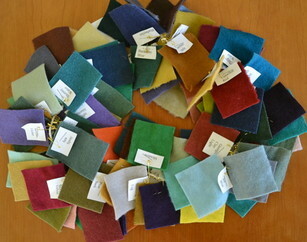 to give a good sample of the colours. This dye book has 87 formulas using Pro Chem dyes. It was written by artist and rug hooking teacher Faith Williston along with her friend Debbie Wiley. They are both from Mississippi and bring a unique colour sense to the dye process.